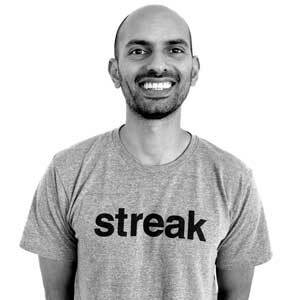 Streak, founded in 2011, was built with the idea of a “deep and embedded integration into Gmail so that salespeople have access to their CRM from their primary work surface—their email inbox,” says Aleem Mawani, CEO and Co-founder of Streak. The deep integration with Gmail and the rest of G Suite is a result of Streak’s close relationship with the Google team. While it takes a moment to wrap users’ heads around the fact that a CRM could actually be run inside their email, it makes perfect sense. It means that salespeople will actually use their CRM, a problem that has plagued the industry for years. The future is where salespeople don’t use two different tools to communicate with their leads and manage those leads in a pipeline. The salespeople spend the majority of their day on administrative tasks and not enough time actually selling. Streak aims to flip that ratio by having the CRM do all the basic follow-ups: updating the status of a deal, scheduling next steps, or even sending documents to customers. Streak accomplishes this by using hundreds of millions of data points from their customers. They are using these data points to build and train a machine-learning AI engine that will do the administrative work for the users. The Streak team realizes that no algorithm is ever perfect, so the interface they are building always asks the salesperson for confirmation before taking action. This lets a salesperson finish all their administrative tasks in minutes as opposed to hours and also helps Streak learn from any mistakes it might make. The future is where humans spend time on what they do best—building relationships, understanding their customers business and closing deals—while all the administrative work is handled by the machine. Another major problem Streak solves is helping sales teams work together. Often times a salesperson would not even know that a teammate has a relationship with a customer they are trying to sell to. Mawani explains that Streak solves this by letting teams selectively share their emails with customers in an automatic fashion. Salespeople can easily see who on their team has talked to a customer before. The future is where every salesperson has the collective customer knowledge of their entire company at their fingertips. Streak is the future of CRM—but who is experiencing that future now? One Streak customer—a company delivering physical products to SaaS industry leaders at tremendous scale— was confident that the tool was saving them each, on average, ten hours a week. Those hours would have been spent looking for missed orders, historical conversations, and tracking down who was responsible for what and when. Streak simplified that. By living in their email, their whole team has been able to collaborate and track interactions with leads—providing newfound clarity to the sales cycle. As a result, orders have stopped falling behind and the team has been collaborating more effectively than ever. The future is where your sales team has clarity on what’s happened before and what’s happening next. Being a thought-leader in the CRM space means that Streak is always looking to the future, and Mawani has his eyes set on what’s next for the tool. The Streak team is already leveraging big data in their automation efforts, but they’re also developing this even further. By bringing the benefits of machine-learning to sales, they are hoping to enable more sales teams to close more deals, more efficiently.